Our range of products include alnico magnets. Ours is an illustrious organization, which is engaged in manufacturing and supplying high-quality Alnico Magnets. 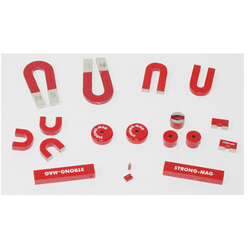 These powerful permanent magnets are made available by us in various shapes such as rubber sheets, rectangular, strips, and rings. All these products are fabricated from best quality nickel, iron, aluminum, copper, and cobalt. Looking for Alnico Magnets ?